Part two of John King's sit down interview with George and Laura Bush on the eve of the dedication of the George W. Bush Presidential Library and Museum. Former President Bush talks about what he learned during his time in the White House and some tough decisions during his presidency. John King sat down with George and Laura Bush for a special private interview on the eve of the dedication of the George W. Bush Presidential Library and Museum. Former President Bush talks about what he learned during his time in the White House and some tough decisions during his presidency. Keeping Them Honest, Anderson Cooper looks at how campaigns and their supporters quickly dismiss polls if they don't support their candidate. Ari Fleischer and Robert Reich weigh in on issues that will be challenging for both sides during the debates. Editor's note: Anderson Cooper speaks with Paul Wolfowitz, who served under former Pres. George W. Bush, about the death of bin Laden. Video clips posted today by a conservative blogger have set off a new round of bitter debate over the Islamic community center and mosque planned near Ground Zero. The clips are from a lecture that Imam Feisel Abdul Rauf gave in 2005. The imam’s critics say one of the clips exposes Rauf’s extremism. This, as Rauf, who served as an ambassador of Islamic faith in America for the Bush administration after the Sept. 11 attacks, is traveling in the Middle East on a State Department sponsored trip. Are the clips part of a smear campaign or do the imam’s critics have legitimate concerns? Tonight, we’ll give you the facts behind the accusations so you make up your own minds. Congress has begun investigating the salmonella outbreak that’s sickened hundreds of people nationwide and led to one of the largest egg recalls in recent U.S. history. The outbreak has been linked to two egg producers in Iowa; together, they’ve recalled more than a half billion eggs. One of the producers has a long history of fines and settlements stemming from allegations of safety and other violations. The outbreak has exposed serious holes in the nation’s food safety net. Journalist and author Michael Pollan joins us tonight to dig deeper, and 360 M.D. Sanjay Gupta will tell you what you should know about salmonella and how to protect yourself from tainted food. Also tonight, dramatic details out of Chile, where against the steepest of odds, 33 trapped miners have been located alive after a cave-in more than two weeks ago. They are safe for now, in a shelter deep underground, but it may be months before they can be rescued. We’ll show you why. Plus, a 360 folo. A former prosecutor is under indictment tonight for what some call highway robbery. Dozens of drivers in southeast Texas demanded justice after being pulled over by police, then stripped of their cash, cars and jewelry. The prosecutor paid three of his secretaries, who he says watched his back, hundreds of thousands above and beyond their salaries. He insists he did nothing wrong. Gary Tuchman has been reporting on this story for months and tonight he brings us new developments. Rove's memoir is a 'work of titanic pettiness', says Klein. There is not much news in Karl Rove's memoir, Courage and Consequence, which is something of a moral triumph for the author. Rove is nothing if not loyal, and these sorts of books tend to create a stir only when they betray the boss. A significant amount of dirt is dished here — an astonishing amount, actually; this is a work of titanic pettiness — but it's all tossed at enemies of George W. Bush. One example: Hillary Clinton is criticized for sitting down, rather than standing, for a photo with rescue workers three days after the 9/11 terrorist attacks. Bush, who had just arrived at ground zero, is standing for photos, and it simply doesn't occur to Rove that Clinton had already spent most of the past several days there, working desperately for her constituents. Rove is not always so unfair; he manages to demolish more than a few of the sillier attacks against him and the President. But this book is primarily an act of vengeance — and, in that sense, unintentionally revealing about the nature of the Bush presidency. Will Iraq's democracy vindicate Bush? Iraq's election on Sunday was 'free and fair', says Frum. Israel may have to retire its title as the only democracy in the Middle East. With Sunday's free and fair national election, Iraq joins the honor roll as one of the very few Islamic democracies. Other Middle Eastern countries hold elections too, of course. But those elections fall into two broad categories. The first category is the blatantly rigged: Iran, most spectacularly, but also Algeria, Egypt, and Yemen, among others. In the second category, elections are more or less honest - but fail to exert much control over the actions of the government: Lebanon, Morocco, and Jordan. 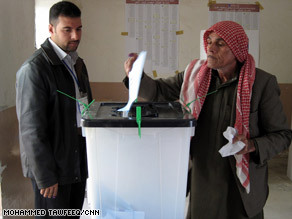 In Iraq, despite violence, votes are honestly counted. Once counted, votes decide who rules. For all the country's well-known problems, that record is a remarkable achievement.